The Makita DRC200Z is a powerful and capable robot vacuum cleaner that performs well on the right surfaces. It struggles with thick pile carpet, but makes light work of hard flooring and hard wearing carpets. Without a base station, however, the manual charging approach won't suit all - but such batteries mean a three-hour cleaning cycle. The majority of modern robot vacuum cleaners are streamlined and packed full of functionality such as compatible apps and pairing with smart voice assistants. Not so with Makita - a brand better known for making power tools - which has built the DRC200Z with power at its core. With two large 18V 4,000mAh lithium-ion batteries under the hood, this is one robo-vac designed to clean for hours and hours. So whether you have a large house or a warehouse, small business or factory floor, the Makita has got you covered. It's immediately apparent from the design that Makita is a firm believer in the "bigger is better" philosophy. The DRC200Z is a monster, dwarfing all other robot vacuums we've tested. It's taller, wider, heavier, has more battery capacity and an enormous dustbin too. With a weight of 7.8kg, the Makita is as heavy as it is large - which can be felt when lugging the 'bot about via its integrated carry handle - featuring large wheels and large cleaning brushes to help with its cleaning tasks. However, this overall weight can lead to problems on thicker carpets. Unlike other robot vacuum cleaners, the Makita DRC200Z doesn't come with a charging dock, instead relying those two two large batteries (which are sold separately). This has advantages and disadvantages: it requires a little more thought about when you're going to charge it and when it's going to be used; it means this robot doesn't need to fuss about getting back to a charging dock, so it can keep going and going. This sort of easy-access logic applies to the rest of the design too. There's no accompanying smartphone app, no clever mapping system, no voice assistant control. It's a nuts and bolts kind of 'bot. However, there is a simple-to-use remote control with large buttons (echoed on the robot itself). Like other robot vacuum cleaners, this Makita uses large dual front brushes sweep nicely at the edges as it cleans. The large size of the robot also allows for a larger main brush than normal. This means it often cleans areas more thoroughly than other robot vacuums we've seen, while the large dustbin is capable of holding much more mess, so it needs emptying less often. The setup of the Makita DRC200Z is the easiest we've seen of any robot vacuum cleaner. There are no apps to worry about and no need to connect to a Wi-Fi network either. It's as simple as unboxing, attaching the brushes, ensuring the batteries are charged then pressing the power button twice to set it off about its cleaning tasks. The manual suggests clearing floors of cables, chairs and anything else that might get in the way before you let this robot loose. We found this to be good advice as this robot cleaner often mounted anything that presented an obstacle then got itself stuck and desperately beeped for help. As long as the floors are clear though, it will just keep going and going. As there are no in-depth settings, it's not possible to setup a daily schedule for cleaning. This is a shame, but makes logical sense as it's up to the user to ensure the robot's batteries are fully charged and any schedule would immediately be rendered useless if you forgot to do so. You can, however, set a start delay on when the robot begins its work. A button on both the remote and the robot itself allow you to set a delay of one, three or five hours before cleaning occurs. It is, therefore, possible to set the robot to work around house or business schedules according to your needs to ensure it doesn't get in the way while it's cleaning. There is a range of other settings on the robot that can be adjusted too. You can opt to turn the vacuum fans off to save power, adjust the cleaning pattern, turn the audible warnings off, or remotely find the vacuum when it's not immediately visible. The Makita DRC200Z has a number of ultrasonic sensors to help it navigate around the area it's cleaning. These sensors are easily visible on the front of the bump rail and they work really well in helping the robot makes its way about. However, its business is very robotic in manner. It moves about in a back-and-forth motion, bumping and banging its way into obstacles, trying to push itself along the very edge of the room. You can choose between either random or pattern cleaning modes and this makes a difference to how it operates, but to look at it does appear to be rather "dumb" compared to other robot vacuum cleaners we've seen. But the cleaning results are not to be sniffed at. The Makita does a good job and picks up dirt well. You just need to be fully aware of the surroundings and how the robot might react when it comes into contact with obstacles. Anything left in the vicinity will either be pushed around the room, mounted or vacuumed up. This robot takes no prisoners and its large wheels mean it can easily climb over and onto a variety of objects, including thresholds into other rooms. To counter this, Makita is kind enough to supply special boundary tape that allows you to block off certain areas and prevent the robot cleaner from going places it shouldn't. This includes going into rooms or areas it might get stuck, or getting too close to objects that might get damaged or broken by accident. The cliff sensors also mean the Makita DRC200Z is capable of cleaning near stairs or drops without risk of falling down. The large size of this robot vacuum means it's less likely to slide under low-lying furniture to clean, but for the same reasons it's also less likely to get stuck underneath such furniture. As well as obstacle detection, the Makita DRC200Z's mammoth size essentially makes it an obstacle in itself. But with a hazard warning light and a buzzer that you can turn on or off according to your needs, you can choose to have the robot beeping as it goes about its cleaning tasks. As its vacuuming noise is far from quiet, though, you're unlikely to need this feature. The main appeal of the Makita DRC200Z is its cleaning power and performance. The use of those 18V 4,000mAh batteries means this robot has incredible amounts of power at its disposal. Each battery takes just 30 minutes to charge with the correct charger (supplied separately) and once that's done it's ready to go. We found these batteries allowed for over three hours of cleaning time, which is by far the most we've seen from any robot vacuum cleaner we've tested. Alternatively, it will clean up to 500 metres squared, which is an incredible amount of space. 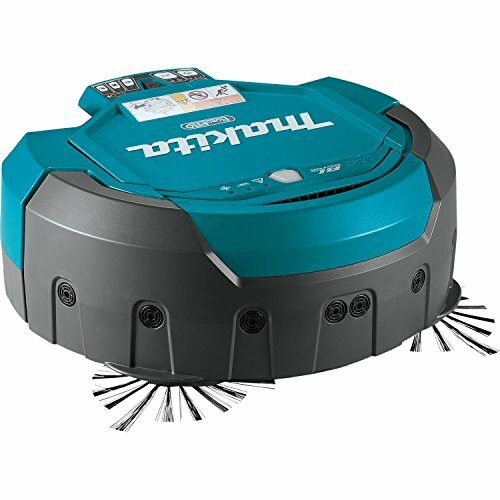 The size of the dustbin, combined with the large front brushes and large main brush means the Makita robot vacuum is capable of sucking up large and small dust particles with ease. It needs to be emptied less often than other robot vacuum cleaners we've tested and therefore requires less maintenance too. The downfall of this robot vacuum cleaner is its size and weight. We found it really struggled with thicker carpets - to the point it would get itself stuck and stop cleaning, loudly beeping to let everyone in the vicinity know until rescued and repositioned. The weight means it digs down into thick pile carpet and simply cannot keep on moving. On thinner, more hard-wearing carpets, the robot cleaner has far less difficulty. Where the Makita DRC200Z shines is on hard flooring - tiles, laminate, wood, and so on. These surfaces are easier for this robot to clean and it has far less trouble with navigating about on them too. The Makita DRC200Z is a powerful and capable robot vacuum cleaner that performs well on the right surfaces. It struggles with thick pile carpet, but makes light work of hard flooring and hard wearing carpets. This robot vacuum doesn't have the intelligence of other smart robot cleaners - there's no Wi-Fi connection, app compatibility or ability to control this one with your voice. But what it lacks in intelligence it more than makes up for in cleaning power. However, without a base station design for automatic recharging, the separate batteries manual charging approach won't suit all. But their capacity means the bot can go on and on - for over three hours - and the large dustbin means less human intervention than other cleaning bots. The biggest downside is the price. The standard robot doesn't come with the batteries or the charger, which puts the price higher than most of the other affordable robo-vacs we've tested. That said, if you have a large hard-floored house, small business or warehouse that needs regular cleaning without the hassle of actually having to vacuum yourself, then it's a winner. When it comes to cleaning, the Samsung VR7000 Powerbot is no slouch, delivering impressive cleaning performance. There's also a mass of features: this robot cleaner is far more capable in terms of intelligence and compatibility. The Ecovacs Deebot R95 MKII has loads of cleaning power backed by a wealth of features. We love its interactive mapping system, easy-to-use app, and more. It's certainly not to be overlooked.